Sadie is a four-year-old Boxer who lives with one-year-old London in Omaha. Both dogs get over excited, bark all the time (especially at other dogs) and do not listen to or respect their guardians. Generally speaking, Boxers are a very determined breed. This determination is most certainly an attribute when they live in a structured environment with clear leadership and are getting the proper exercise and discipline that they need in order to thrive. 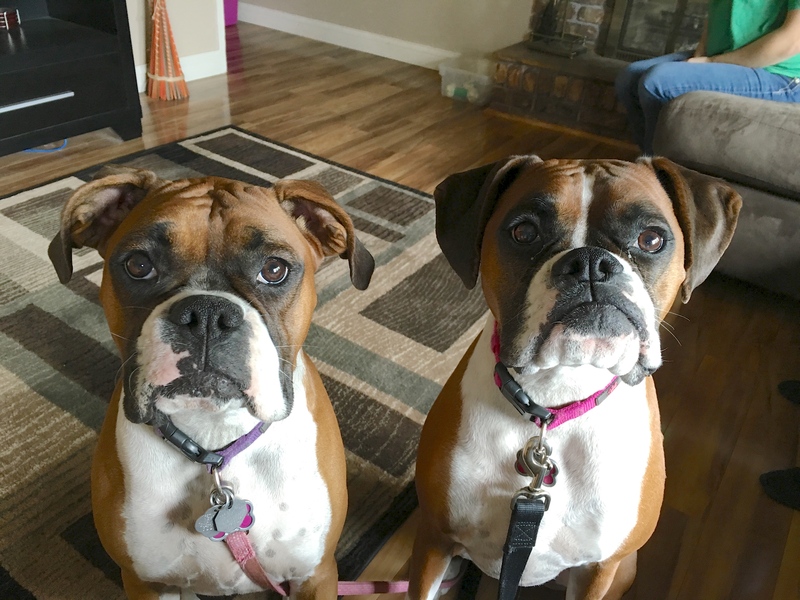 So if you place multiple Boxers into a home without much structure or leadership, they are absolutely going to push the envelope and see if they can assert themselves as the authority figure. It only took a couple of minutes in the greeting before I started thinking that may be the case with this pair. I was initially impressed with London’s behavior at the door, sitting and giving eye contact without any signs of unwanted behaviors. But as you can see in the above video, Sadie stormed right in with an unbalanced energy which provoked a reaction from both dogs. When dogs that are normally OK together suddenly fight in this sort of situation, we call it Redirected Aggression. This is often a result of dogs that live in a home without a clear leadership structure established. When I sat down with the dog’s guardians, I got a pretty clear window to the dynamic in these dog’s home. Because Sadie and London’s guardians had failed to incorporate rules or structure, the dogs had began to see themselves as being peers to the humans. When dogs consider themselves as equals, then listening to the humans become elective. This also means that the dogs will often try to work out problems themselves rather than looking to an authority figure to sort it out for them. Now I’ve worked with a lot of dogs who are excited and don’t have the proper respect for their guardians, but this pair took the cake. They were so excited they could barely contain themselves. They jumped up on the furniture and their guardians as if they were the ground. I knew I needed to settle the dogs down before I could start to work with them, so I introduced something I like to call the leash timeout. After going over the Leash timeout concept, I spent a few minutes discussing how dogs learn. and how important timing is to association. To a dog, If you do not disagree with something that its doing, it assumes that you are OK with it. Because of this, you need to immediately disagree with the dog any time it starts to engage in any action or behavior that you do not approve of. If your correction or reward comes three or more seconds after the dog engages in a specific activity, the dog cannot make the connection. That is why it is of paramount importance that we immediately disagree or rewarded dog as soon as it does something we do or do not like. Expect a window of three seconds from when the dog engages in the behavior, max. Because these dog showed no respect for their human’s personal space or authority, I went over a technique that I like to call Petting with a purpose. By asking the dogs to sit or lie down prior to providing them with attention or affection, we can help them develop a healthy respect for the human’s authority and leadership. It will take a couple of days before all of the humans get into a habit of not instinctively petting the dogs when they nudge or demand it. But once the humans make the switch, they will unconsciously reinforce a healthy leader follower dynamic every time that they pet their dogs. Putting with a purpose is a powerful tool that helps utilize positive reinforcement. But because these dogs are so unruly, it will be important for their guardians to be able to communicate when they disagree as well. To help them articulate that message in a way that the dogs will understand and respect, I went over a series of escalating consequences that I developed a few years ago. It will be crucially important for the dog’s guardians to consistently apply these consequences with good timing in order for the dogs to understand what it is that humans are disagreeing with. In addition to helping make it easier for the dogs to understand, disagreeing with a dog before it really gets worked up is a much more effective technique to use. To help the guardians practice their timing and technique, I walked them through a leadership exercise that I developed around the same time I came up with the escalating consequences. This exercise involves the dog learning that it has to ignore a high-value treat that is placed in the middle of the floor in a completely available position. After the dog communicated that they understood that they cannot have this easily accessible food item without permission – did humans allow them to have it. One of the dogs was easier to do this exercise with than the other and it was the opposite dog from what the guardians expected. This is frequently the case. I strongly suggested that the guardians practice this exercise with both dogs separately and gradually increase the amount of time the dog is expected to wait before giving permission to have the treat. This will give the dog the ability to build up its self restraint muscles; a skill that will be crucially important for these dogs. One of the biggest impactors in these dog’s rehabilitation will be increasing their constructive exercise. Being on the higher energy side of the street, it is unreasonable to expect these dogs to behave or listen properly unless the guardians are filling the exercise needs these dogs require. I also strongly recommended that this exercise be initiated as early in the day as possible. So that the guardians can utilize the walk as part of this exercise regimen, I headed outside with Sadie and her guardian so that we could practice walking in a heel position by utilizing a martingale collar with the special twist of the leash. At first Sadie was all over the place, but with a little patience and persistence from her handler, she quickly got the message and started to walk in a nice heel position. A big part of this success was the guardians technique improved as we practiced. At first her corrections were too late or too soft for the dog to completely understand. But once the guardian got the handle of things, Sadie started to respond beautifully. When we returned to the home, I showed the dogs guardians how to add structure to mealtime to further develop the dog’s respect for them as authority figures. Its going to be extremely important that the guardians strictly follow the new rules that we put into place during the session. The dogs are most certainly going to probe and push and do everything they can to try to get around them and wear their guardians down. This is truly a situation of whoever blinks first wins. The good news, is these dogs clearly want to please. By consistently communicating what we did and did not want from them, and being persistent while following through, the dogs eventually got the message, settled down and started responding as followers. By the end of the session, the dogs had stopped trying to jump up on the furniture or their guardians, were listening to commands and corrections right away and were no longer over excited. The guardians will need to consistently apply the Petting with a purpose technique, master the leadership exercise, consistently enforce the new rules and provide the dogs with the exercise and discipline they need. If they can do this over the next two weeks, they will start to see a real metamorphosis with these Boxers. It’s going to take some time and effort, but the dogs these guardians want is absolutely in there. It’s going to be up to the guardians to help bring those dogs out.